Among the many flying machines drawn by Leonardo, some are evidently better designed than others. Such drawings are painstakingly detailed with nothing left to chance. The details of the various mechanisms are also carefully described in the text. It’s obvious that Leonardo was convinced a machine would work when there are clear descriptions of the materials to be used in the construction, the dimensions and the piloting technique. This is the case with the machine Leonardo drew on folio 749 recto of the Codex Atlanticus between 1496 and 1499, while he was still in Milan. It was probably the machine he wanted to build in secret beside the cathedral, in what is now the Palazzo Reale or Royal Palace. The pilot is positioned upright inside the wooden cockpit with the beating of the wings entrusted to the combined use of arms and legs. 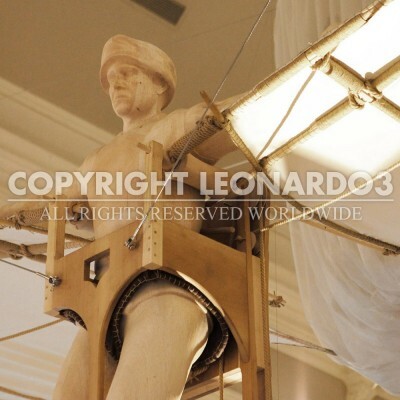 The feet are inserted into two stirrups, which Leonardo described as offering maximum power. Behind the pilot is a complex system of pulleys and levers that make the large wings fold inwards for the downstroke to imitate the wings of a bird. Leonardo didn’t neglect any details. He even drew the machine so the pilot’s feet can touch the ground while holding it up with his arms during takeoff and landing.